The Hamster lay in his burrow beneath the Syrian Steppe. He could not see what was happening above his nest, but he could hear. He could hear the rumble of tracked vehicles, the thud of guns, the screams of missiles and men dying in the hot sun of the dry Steppe. But it was all nothing to do with him. 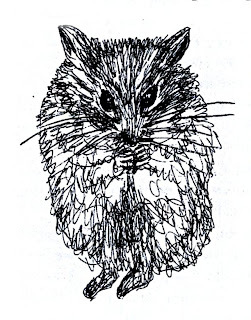 The accumulated wisdom of many generations of ancestors told him that a wise creature is one who lives apart even from his own kind, expresses no opinions, indeed has no opinions about anything, who guards his own burrow, gathers his own food, and lives out his short life in solitary safety. This was the Hamster’s philosophy and it had served him well - until he met the Rats. There were three of them, quite ordinary Black Rats, surprisingly friendly but, their eyes blazing with the fires of righteousness, quite manic in the darkening evening. With them they had a pair of Jirds, your cousins the Rats said, to act as scouts and guides. The Rats had come to the Middle East by ship, but the Jirds were natives - from down there, waving their paws towards the South East. Their mission? To seek and to destroy. To seek for and to destroy what, the alarmed Hamster wanted to know. Snakes, the Rats answered in an excited unison. Their Masters’ Intelligence agents had discovered an enormous colony of killer MacMahon’s Vipers hidden not three kilometres from the Hamster’s burrow. Their Control had fitted the rats with mouth pouches, rather like the Hamster’s they thought, only theirs were filled with poison. When they released it into the Vipers’ waterholes, it would destroy the terrorising reptiles and the Hamster would be free again from danger. The Hamster, much perturbed, filled his pouches. He ignored the water hole - like the Jirds he had no need of water - and scuttled back to his burrow fervently wishing that he had never met the Black Rats. Shivering in spite of the warmth of his deep home, he lay in his nest for many days until hunger drove him out once more into the night. Some irresistible impulse took him back to the Black Rats’ waterhole.